Scar tissue development is a natural and important part of the healing process. A scar forms to repair the skin and other tissues that are damaged by trauma, burns or surgical incisions. Without the process of scarring, wounds would not close. Although some of the people that I treat in the clinic are concerned about the appearance of their scars, I find that the majority who attend hand therapy don’t seem to be. In fact, surprisingly, the scar is often considered to be a badge of honor, a tribute to the injury that was overcome. So, if scarring is a natural process and improved appearance is not a concern, why is it important to address scarring in injuries or after a surgery? Our skin and the tissues underneath it (fascia, tendons, nerves) are arranged in layers that slide and glide on each other. When a scar forms, the body does not differentiate these layers of tissue but lays down collagen to fill in the wound – binding all the tissues together. This binding can lead to loss of full motion; to a feeling of stiffness even if motion is fully restored; and to pain as tissues that normally slide smoothly on and around each other begin tugging and creating friction.. Fully straighten the fingers of your left hand and look at the skin on the back of your hand. The skin is loose and you will be able to see small wrinkles. Now, make a fist with your left hand. Pay attention to how the hand feels while making that fist. You should be able to make a fist easily (assuming you have not had an injury). Observe how the skin tightens over the back of the hand and the wrinkles disappear for the most part when your hand is positioned in a full fist..
Now, open the hand again. Place your right fingers over the back of the left hand with some firm (but not painful) pressure. Attempt to make a fist with the left hand while maintaining the pressure against the back of the hand with the right fingers. Do you notice a difference in the effort that it takes to attempt to make a fist as the tissues are prevented from sliding over each other? Open the hand again. Now, actually push the skin towards the wrist with the right fingers as you attempt to make a fist with the left hand. Can you feel the stress of the movement translated even into the tips of the fingers? This demonstrates the effect of an outside force impeding the normal sliding of tissues during movement. So, what can we do to limit the effect of the scar formation on the surrounding tissues? Massage the scar – 2-3X a day for 2-3 minutes each session. Perform small circles over the scar. Place your fingers just to the side of the scar and push into the scar tightness. Repeat in the opposite direction. Repeat along the length of the scar. Try to lift or roll the scar up from the tissues underneath it. Do not rub the scar vigorously. This creates friction and can cause blistering in a new scar. Do not separate the sides of the scar or pull the scar to widen it. 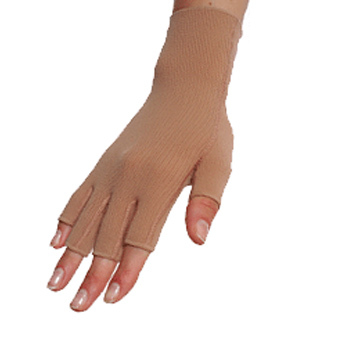 Provide compression over the scar with gloves or sleeves or a scar mold provided by a therapist. Use silicone gel pads over the scar at night. Perform range of motion exercises as able (depending upon any precautions related to the type of injury) so that the scar is lengthening during the healing phase. If the scar continues to cause pain or problems after its natural remodeling phase, there may be other medical options to minimize the effect of the scar including laser treatments, corticosteroid injections, and surgical removal.